In March, Egg Studios locked out 290 freelance film technicians, members of IATSE Local 849 after failing to reach a second collective agreement. Sébastien Labelle writes on the ongoing dispute. Sébastien is a self-employed actor and member of ACTRA. He is also VP (Culture & Mayworks) at the Halifax-Dartmouth & District Labour Council, a member of Solidarity Halifax and a former union organizer with the Service Employees International Union Local 2. This post was originally published by the Halifax Media Co-op. Debate seems only to have escalated since I last wrote down my thoughts about the labour dispute at Egg Films (more recently re-branded as “Egg Studios”). I’ve received cordial personal rebuts to my arguments, but the online Egg Films PR campaign has taken an increasingly unsavoury intensity. Let me be clear here before I go on that my ire is not directed at employees of Egg Films / Egg Studios – whether full-time or contract. My conversations with any of them have always been respectful and friendly. What I take issue with here is the online PR campaign directed by Egg Films, which is egregiously distorting facts and rapidly evolving into an assault on unions in general. To lead this campaign, Egg Films has properly taken the first step in any union-busting playbook, which is to follow the advice of a union-busting consulting firm. In this case: Chardin Consulting* led by Michael Kydd, formerly the President of the anti-union construction outfit Merit Contractors (I’ll let you do your own Google searches). I’ll also disclose that I’ve had little direct contact with the IATSE 849 members affected by this labour dispute, but as a former union organizer who helped workers in the private sector form unions in their workplace, I recognize a union-busting campaign when I see one. Over the last month, many of my colleagues in the arts community have expressed increased confusion about the dispute. To help, I thought I’d make an attempt here to unwind some misinformation being spun on the matter. In previous months, Egg Films had repeatedly argued on social media that the IATSE 849 members it employed (prior to locking them out) were not employees of Egg Films, but rather independent contractors who should therefore not be permitted to unionize as employees of Egg Films. Judging from the Labour Board document laying out their ruling on the matter, this has also served as Egg Films’ main argument when challenging the certification through legal means. It can certainly be argued that the Trade Union Act is antiquated in how it divides a set a provisions for certification in the construction industry and another single set of provisions to cover certifications in every other industry under the sun. This binary articulation leaves workers such as those affected here in a grey zone where the Labour Board is forced to make concessions in order to protect workers’ rights until new legislation is drafted that better reflects current labour markets. While Egg Films’ very expensive legal strategy has almost exclusively focused on the matter of employee recognition and making sure NO ONE could have the right to vote, their social media PR campaign hypocritically focuses instead on claims of “undemocratic behaviour” on the part of IATSE, whom they blame for not allowing ENOUGH people to vote. The absence of these claims from their legal strategy at the Labour Board reflects the fact that Egg Films has no legal grounds here. However, they’ve made very good use of crafty PR spin about democracy to pull liberal heart strings and detract people from the fact that they’ve been fighting all the way to the Supreme Court of Canada to strip away ANY of their contract employees’ right to vote at all. Egg Films likes to harp on the fact that only five people voted in response to the union application. When considering that IATSE 849 counts approximately 350 members, this does seem to constitute a very low level of voter participation and therefore poor representation of the membership’s opinion on the matter. But in order to understand what happened here, it is first very important to understand what rules a union must abide by in order to have their certification granted by the Labour Board. These rules, by the way, do not favour unions and make it extremely difficult to certify where contractual employment relationships exist. In order to certify a bargaining unit at Egg Films, IATSE has had to wait for an opportunity where enough workers out of its 350 members, or any other supporters of forming a union, would work together on a same day and then be available to go vote whenever the date and time were set by the Labour Board. According to Egg Films’s statements to the Labour Board, they only shoot 10 to 15 days per year and only on very large projects will they hire more than a dozen contract workers. Most shoots only require 3 to 5 workers making it too risky to even try to apply for a union vote. In this case, the application was filed on the day of a very large shoot where about 35 workers were employed by Egg Films. Only 12 of those were already IATSE members. We’ve heard that many of those members were employed through another project on the day of the vote and could not cast a ballot. Others perhaps have chosen not to vote at all. That also is an option and, of course, their choice. That still leaves the 20 or so workers who were not IATSE members and therefore people whom the union did not necessarily have a means to contact. The employer, however, does have means to contact them (they have an employment contract with them, and presumably have contact information so they can communicate with them, send them cheques and contract their work). In fact, the employer has the legal responsibility to inform all affected employees about the vote. Because a union won’t necessarily have the ability to contact everyone, the onus is on the employer – not the union – to get its own employees to go vote. The union’s responsibility is to provide evidence that it counts 40% membership among those eligible to vote (which it did) in order to trigger the vote. To IATSE’s credit, they waited for an opportunity where there would be as many workers as possible eligible to vote. They applied for union certification on a day of shooting where about 35 workers would be eligible, which, as Egg Films admits, is highly unusual. They gave as best an opportunity they could, under the existing rules, for workers impacted to have a chance to vote, given that the date of the vote, the voting times and the voting location are chosen solely by the Labour Board and not by the union or the employer. Egg Films also admits that IATSE made phone calls to ensure that their members knew about the vote and encouraged them to exercise their right. Ultimately, five workers made it to the vote. Some couldn’t make it, some chose not to go, others who were not already IATSE members might not have been aware perhaps because Egg Films didn’t inform them. But in the end, the majority of those who did vote, voted in favour. Wouldn’t it make more sense to have the 350 members vote on the matter? Why yes, it would. That would be lovely, if only it were legal! So why doesn’t labour law operate this way? Because employers would quickly argue that this would give unions an unfair advantage. Imagine: all 350 members can vote – all are already union members, only the union has contact with most of them or even the ability to contact them. It’s easy to guess what the outcome would likely have been if all 350 had been given the ability to cast a ballot on the day of the vote (before all the spin hit the fans). And don’t forget, Egg Films’ legal argument has been that NO ONE should vote! They’ve spent thousands upon thousands in courts arguing that nobody – not a single IATSE member or contract technician – should have had the ability to vote at all. Regardless of what they say on social media. Lastly, on the matter of voting, Egg Films claims workers were bullied into voting union, but the only quote they have is from someone saying they got a call informing them of the vote and being asked if the union can count on their support. This hardly sounds like bullying. IATSE representatives were evidently making sure anyone who might be eligible to vote (and for whom they had contact information to reach) was informed about when it would happen and then polling them about support like any political party does with their members during election time in order to gauge the odds of success. At least, that’s what the only evidence provided by Egg Films suggests to me. The owners of Egg Films like to cry victim by saying that both the union and the Labour Board took advantage of the fact that they did not know or understand labour law. I have very little sympathy for employers managing a leading company in the region who say they don’t know labour law. It’s about time they paid attention to the laws that govern how they should be operating. Also, following the application, they’ve hired the services of one of the leading (and very pricey) employer-side labour law firms in the province. So, I’m sure they’ve had pretty solid schooling on the law when addressing the Labour Board following the application. From the lengthy Labour Board decisions and Nova Scotia Appeals Court ruling, it seems clear that Egg Films has had competent legal counsel throughout. Egg Films has also repeatedly accused IATSE of illegal machinations. Yet, the Labour Board’s report makes no mention of any such claim brought to their attention. If there was wrong doing, why hasn’t an Unfair Labour Practice complaint been filed against the union by Egg Films? Why wasn’t it mentioned during hearings about the certification? Egg Films keeps claiming on social media that IATSE cheated, but have made no legal complaints. The truth is that IATSE has followed all the rules to win the certification and Egg Films has no legal grounds to support any accusations of malfeasance. Egg Films’ appeals to throw out the certification have been rejected by every court all the way up to the Supreme Court of Canada. The owners of Egg Films have also often shed crocodile tears about how unionization will make them non-competitive and undermine their business. They’ve also made this claim at Labour Board hearings. However, the Labour Board report states that little evidence was provided to prove that certification would have ruinous impacts on the business. The Coast recently reported that Egg Films has an annual revenue of $4 million. Surely, they can afford social safety net contributions for the occasional contract workers they hire. I’m sure this would not hamper their noble charitable activities in the community. One could speculate that the amount that Egg Films has spent on legal counsel and other costs to fight this certification (including being ordered by the Supreme Court of Canada to pay IATSE’s legal costs related to Egg Films’ attempt to have the Supreme Court hear a further appeal on the certification) far out-weigh any possible costs that Egg Films could have incurred in providing Workers’ Compensation, Employment Insurance and pension coverage to these workers. Lets remind ourselves here that IATSE has stated that wages are not their primary concern at Egg Films and that what’s being sought by the union is employer contributions to EI, pensions and Workers’ Compensation so as to ensure that workers have the ability to build essential safety nets despite making a living through a patchwork of contracts. Of course, a negotiating team won’t present offers made by an employer to all members for a vote every time an offer is made. This would be a terrible waste of everyone’s time. They will only present an offer to the broader membership once it has arrived at a tentative agreement with the employer that it considers worthy to vote on and which it can recommend to the membership. This is what they are entrusted to do by the membership. Obviously, this offer was not deemed worthy of a vote and the employer chose to end negotiations and lock out the workers rather than pursue a course that could lead to a tentative agreement. Let’s not forget also that Egg Films has operated under a union contract for a whole year. This first contract was arbitrated by the Labour Board following a ruling that Egg Films had failed to make the necessary efforts to negotiate with the union. With the expiration of this contract, Egg Films has resumed their previous practice by refusing to fairly negotiate and once more refusing to even recognize the union. Again, their legal argument here rests primarily on their claim that none of the workers had a right to vote on forming a union at all. 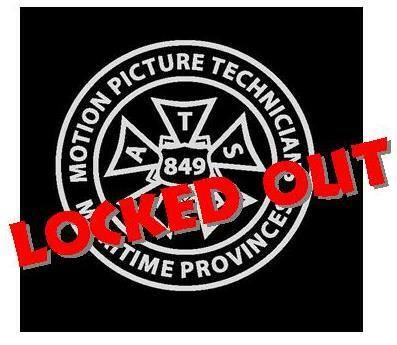 Egg Films locked out IATSE members before the union made any moves towards a work stoppage. People being prevented from working is a result of the employer’s decision. IATSE has no other option than to prevent other members from bypassing those locked out or else those who are locked out will never have a chance to work there again. Egg Films would simply have the ability to employ other skilled union members to fill their jobs. Of course, Egg Films is currently doing this with non-union workers, but if a union were to allow its own members to replace locked out workers, or otherwise facilitate the operations of an unfair employer, it would immediately loose any leverage it has to demand a return to work for those locked out, dooming them to perpetual unemployment at Egg Films. It’s become clear that there are dissenting voices from within the union regarding the labour dispute. And Egg Films is taking every chance it has to magnify this dissent. The fact that unhappy members feel unrepresented by their union is terrible. No question. IATSE has to take a serious look inwards to address why this is happening. Evidently, IATSE has failed to adequately educate and consult its members about what it does, how it functions, and the importance of organizing non-union work environments. But, really, the blame doesn’t lie only on IATSE here. The whole labour movement is dreadfully suffering from a mix of unwillingness and inadequate resources being dedicated to educating union members about these things. Popsicle ads from the Canadian Labour Congress really doesn’t cut it. It’s no wonder that union support in society has been at such a low and that companies can repeatedly spin blame on unions for economic and workplace woes. And this, despite repeated studies that prove unionization improves workplace conditions, which then leads to overall improvements to our economy and society as a whole (Labour Rights, Inequality and Democracy; Labour unions in the 21st century?). As I’ve mentioned before, within the existing rules for union certification, IATSE filed for application on a day where a high percentage of affected workers would be eligible to vote. Not everyone could make it on the day of the vote, but that’s out of their hands. They don’t choose the day of the vote, only the day of application. They don’t choose who is eligible to vote either, as the Labour Board solely determines that based on the law. What too few people understand, even among any union membership, is that unions have an inherent imperative to unionize non-union workplaces. That’s what unions do! That’s what they HAVE TO do! A union’s leverage to make gains in a workplace correlates with the union density within the industry in which it’s trying to negotiate a contract. That means the higher the proportion of unionization in the industry, the better a union’s ability to make a case for improved standards in the industry. The reverse is also true. If a union becomes an island in an industry where non-union work is the norm, then the lowered standards around it will weigh down its ability to lift up conditions for all workers in the industry. In fact, the presence of any lowered conditions in the industry makes it harder to have higher standards respected anywhere else in the industry. Employers will relish the opportunity to point their finger at examples where lower standards are offered. Organizing Egg Films is both a response to workers who have worked at Egg Films and expressed the desire to unionize (why would IATSE even try if there wasn’t indication that there would be support to even win a vote in the first place? ), and is also a matter of self-preservation in the interest of their entire membership. This is even to the benefit of non-union workers. The high wages in non-union work at Egg Films and elsewhere in the province are a result of the high union density within the industry. Even if you’re a not a union member, the strength of IATSE and its hard fought attempts to organize job sites to improve wages and working conditions in the past are the reason wages and conditions are were they are now. Moreover, with the reduction of union work available in the feature film and TV sector as a result of the gutting of the Film Tax Credit, the proportion of non-union work becomes higher. Although the Tax Credit fiasco could not have been foreseen by IATSE, the move to unionize commercial work becomes even more important and signifies prudent and just direction on their part as a matter of interest for their members. If there is to be fewer film jobs in the province, then it becomes all the more crucial that commercial and other media work offers proper wages, benefits and union protection. IATSE members (like ACTRA members) need to be fighting for good film jobs that provide fair and stable living standards, not just any film jobs. Otherwise, we’re all just fighting for crumbs. There’s certainly work to be done to improve labour law, and unions have a long way to go to improve participation and education within their own ranks, but ultimately IATSE 849 won the union certification legally, clearly, and squarely. The Egg Films PR campaign is only intended to divert attention away from the fact the Egg Films has no legal grounds to contest the union certification and is illegally refusing to negotiate. It is also intended to divert attention away form the fact that Egg Films has been waging a legal fight to prevent any contract workers they employ from having a right to vote to form a union. Moreover, the campaign serves as a surreptitious drive to paint unions in a bad light in order to further drive away public support for unions in general, making it easier for Egg Films’ pals at Chardin and the CFIB to bust needed union drives in the private sector. Pretending that the certification isn’t valid is petty and harmful. It is also dragging friends and colleagues in an industry already suffering from high stress into a prolonged unnecessary strife. This happened way before the elimination of the Film Tax Credit. It is Egg Films who is dragging this on through this difficult period in the industry and refusing to give people work. As I’ve said before, if employers are the motors of our economy like they claim to be, then they have a social obligation to foster an economy that will provide safe, secure and livable working conditions for all those who participate in the economy. Finally, I hope IATSE members will commit themselves to being involved in their union because it’s going to need to be as strong as ever going forward in this province. It was union members – more than anyone else by a long shot – who filled the streets to protest the elimination of the Film Tax Credit, and we all need to remember that. *While I can’t prove that Egg Films has employed Chardin to run their PR campaign, one can make a pretty safe assumption. Michael Kydd, owner of Chardin, is a regular contributor to comment threads on social media posts regarding this labour dispute. 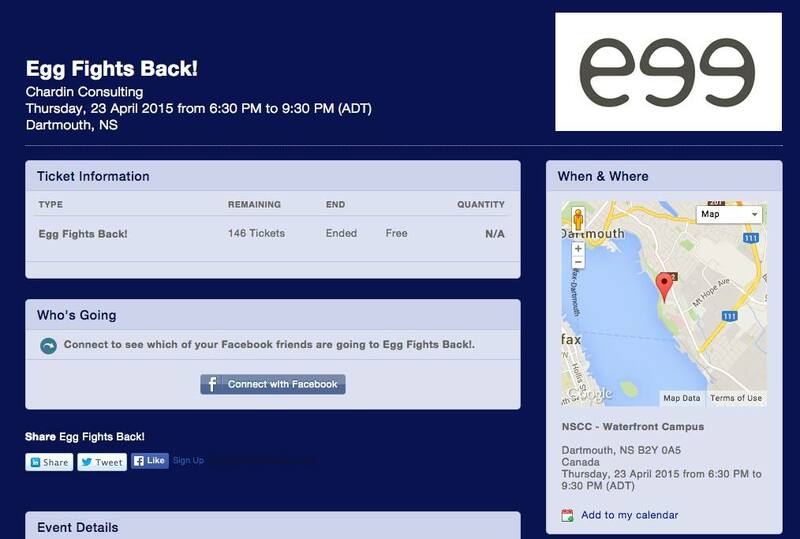 More revealing still is that the Egg Films Tedx style event, which was originally planned all the way back in April (despite them publicly stating it was a last minute initiative to finally get the “truth” out in July) listed Chardin Consulting as the organizer on the original event page.